I have been selling a lot of these cameras mainly due to the fast frame rate. Why will this camera run at 27fps at full res in the Infinity software but maxes at 7-8fps in Premier at full res, Bin 1, 8-bit mono or 24-bit color? Will (or can) this be improved? This frame rate is barely enough to use Live Tiling or Live EDF. 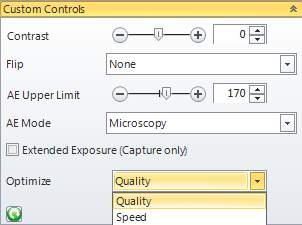 In the Custom section under the Settings Tab of the Capture Panel there is a selection box named Optimize that is set by default to Quality. If you set that to Speed, you should see the faster frame rate. For color cameras, setting the Bayer Interpolation to faster interpolation method will also improve the frame rate. Bicubic is the slowest interpolation method. Yes, it is in 9.2, but you may apply a hotfix to 9.1.4 to obtain this functionality. Trey, I don't have the Optimize choice in Premier 9.1.4. Is this something new in 9.2?